The excitement for Tommy's Nite Out III seems to be building. Our family is so blessed and humbled by the show of love from all of those involved with this endeavor. It seems to grow with each event. I am truly excited to see so many old friends that are planning on coming; as well as, new friends that have heard about this great party! This will be a unique gathering and fun for all. The steering committee and the multiple sub committees have worked tirelessly to create a special evening for everyone's enjoyment. It is amazing to think that this all started three and a half years ago in Dallas, Texas when I was still at Craig Hospital in Colorado. Someone recently asked why they called it Tommy's Nite Out when I was not able to attend. Robyn and I both said it was the spirit of our friends. They knew that even though I would not physically be there, I would love being in the middle of all my friends having fun. I am so glad that I have been able to attend all three events here in Fayetteville, and to be a part of this great gathering of folks! Ephesians 3:17-19 "...And I pray that you, being rooted and established in love, may have power, together with all the saints, to grasp how wide and long and high and deep is the love of Christ, and to know this love that surpasses knowledge-that you may be filled to the measure of all the fullness of God." Tommy and I are so excited to tell you that, believe it or not, there is going to be a Tommy's Nite Out on September 14th! We went to the first meeting last Thursday night at Tony Sherman, our fearless leader's, office. Tommy and I were running late and when we walked in we were stunned at the people gathered in the conference room. The excitement level in the room is high anticipating the fun we are going to have at the Pendergraft barn. After the meeting, Tommy and I told each other that we both cried on the inside because we are so humbled by our wonderful friends. We are blessed beyond measure, and as always we are witnesses of God's love through the faithfulness of our friends. OK people, this is our 5th day of over 100 degree temperatures. Since my injury, my body temperature is about 96 degrees. THEREFORE, I love the hot weather. However, those around me are dropping like flies. Have a good weekend. Tommy and I had a couple of T-sips in from Austin last week. Gordon and Sarah McHaney. Sarah and I went to college together, and the couple became our friends after we married. Gordon and Sarah LOVE the outdoors so they came to beautiful Arkansas to fish the White River, canoe the Buffalo, and to experience Eureka Springs. On their way back home to Texas they stayed with us for the night. Tommy missed his calling as a tour guide because he loves showing off Fayetteville to guests! We loaded up the magic van and showed the McHaneys Razorback Stadium, Baum Stadium, U of A campus, Dickson street, and the beautiful houses in the historic district. 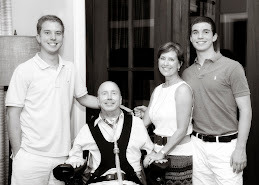 We initiated them into our way of life when the power on Tommy's ventilator got very low. I was driving, and the McHaneys were biting their lips with anxiety. Sarah is definitely one to have in an emergency, she just took the "ambu" bag and was on the ready. She had to use it on Tommy while I changed tubing from the chair ventilator to the bedside ventilator. I wish I had that on video, it was classic. Thank you Gordon and Sarah for your help and friendship! I have had "good intentions" of sustaining regular blog updates. Obviously, I have not met that goal this year. Believe it or not I have been very busy trying to juggle health care and business. The good news is I have been relatively healthy, and I have been able to participate regularly at work with a reduced schedule. 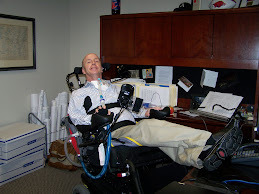 Just recently, I was blessed with a new wheelchair that will help with my quality of life and nagging health issues. For instance, I was experiencing chronic head pains associated with the head rest and my positioning within the chair. This chair, with a few adjustments to the head rest, seems to have decreased my issues with head pain. Also, this new chair allows me to recline completely which is good for doctor visits, blood pressure issues, and pressure point redistribution. Speaking of doctor visits, a few months ago I visited Dr. Luke Knox, my neurosurgeon, to make sure that the snap, crackle and pops I was hearing were not just a loose screw in my head. Dr. Knox assured me that was not the case, and in fact four times during our hour session he would get right in my face and tell me "how good I looked." After my usual answer of "well, of course I do" I got serious and asked, "what did you expect for me to look like?" 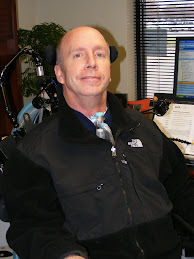 His answer was simply that many times people in my condition, especially ventilator dependent people, are chronically ill, slumped over and generally do not look healthy. The reason I am mentioning this to you is not to just brag about my good looks, but also to let you know that "I look healthy" because of your generosity which allows me to have great care. I have been so blessed to have people who are not only caregivers, but who also generally care about me and my family. When you need as much care as I require this is a tremendous blessing for the whole family. I also wanted to let you know that besides work and doctor's visits, that we have been able to make a trip. I actually wrote this blog from Florida! Through the incredible generosity of a man who himself is wheelchair dependent, and I have yet to meet, our family has been able to take our first vacation since my accident. As our boys get older and they juggle summer jobs, it is such a treat to have all of us together at the same time. So for now please know that Robyn, Ross, Jack and I continue to live our life one day at a time. Anytime we may feel discouraged or frustrated all we have to do is count our blessings and rejoice. We are still amazed that after three and a half years our friends continue to reach out to us in different ways. We see first hand how God in His mysterious and infinite wisdom weaves our lives with other's lives for blessing and Glory to His name. We can not believe that again our friends have decided to throw another Tommy's Night Out in order to help us with our expenses. As always we pray that those who touch our lives in any way are blessed with the knowledge that God is present in each of our lives and circumstances. "Be joyful always; pray continually; give thanks in all circumstances, for this is God's will for you in Christ Jesus." Please do not interpret our delay in reaching out to you as anything, but Tommy and I processing the magnitude of your generosity and basically what this group has done for us. I wish we could express this in a more creative way than just words because words really do fail us at this time. I can tell you that several times Saturday night I was overcome with gratitude and sheer blessing to know that I would not want to be anywhere else in the world besides in that room with all of you. Again you have taken what was suppose to be a tragedy and turned it into a triumph of Spirit and sheer good will. Every one of you have not only shared your heart and soul, but your hands and feet. I promise I don't mean to sound "too religious," but you have allowed God to use each one of you in our lives to live out what Scripture commands us to do for one another. Tommy and I really are humbled by this and we continue to pray that our circumstances will be used to glorify God. Through these events you have enabled us to be comforted with good care so we are not overcome, but we are able to concentrate on what is truly important and that is our relationships. THERE IS NO GREATER GIFT THAN TO LOVE ONE ANOTHER! Thank you for loving our family, and I beg your patience as we continue to learn from you how to go forward and love not only you, but others as they are brought into our path. We pray that you truly have been blessed through this time, we do not want this to be a one-way blessing! The party could not have been more beautiful and successful. We heard over and over again how impressed people were with how well the event was executed and the abundance that came forth from such a small group over such a short period of time. From Tony and Mary Beth's stewardship to the phone-a-thon, to all of the details of paper work, e-mails, errands, input, output, the food-I heard was delicious, the band-that was awesome, the blood, sweat, tears, the clean up crew, the precious parking crew, the bar crew, the auction group, the people who donated the fabulous auction items and those who bought them. FUN, FUN, FUN! Those who donated and didn't even come to the party. Okay I am in tears now, the list goes on and on. If somehow we do not personally thank you, please know we have prayed for you and are so grateful for you. We want to hear details and behind the scenes stories, so we will have a get-together soon to share our experiences. We would love to hear stories from anyone who wants to share. Tommy hopes to be sending a blog today or tomorrow sharing a story (he has to get permission) so stay tuned. Tommy, Robyn, Ross and Jack"
Recently I was asked to share my thoughts about Tommy's Nite Out for a mass email that is sent out by the Steering Committee. I know some of you may have already seen the below note. However, I wanted to make sure everyone is aware of how grateful and lucky Robyn and I are to call you our friends. The last several months have been a little precarious with regard to pesky health issues. However, I am happy to say that I feel better than ever and am ready to continue moving forward. As always, my family, caregivers and friends put in great effort in helping me overcome these obstacles. My family has been so blessed with the many people who have come together in good spirit to care for our family at this time. Tommy's Nite Out was a wonderful gathering of friends far and near...some who haven't seen each other in 30 years and some who see each other on a daily basis. Everyone was connected by past and present...it was magical! Tommy's Nite Out was a blessing, completely unexpected. An anonymous guest commented that he did not believe in "the whole God thing" but that there is something special going on here...those of us intimately involved with the event choose to believe the Holy Spirit was hard at work that night. I was humbled by the experience and outpouring of love by so many known and unknown to me. Most off all, it was a heck of a good time! My family is honored to know that those who took on this project ("the Steering Committee") have decided to put together a second Tommy's Nite Out. Additionally, we are grateful for those who have already begun to participate in Tommy's Nite Out II. We are blessed to have so many wonderful people in our lives. Your love continues to humble me and I look forward to seeing you all on March 12th! The entire VanZandt family is very thankful for all of the prayers and thoughtful gestures that have been offered up the last few weeks. They really do feel blessed by these actions. Many of you have asked me what more can be done. Tommy faces a long rehabilitation period and the expenses the family will incur will be substantial. In addition to the uninsured portion of his medical expenses, he will need to maintain duel households in Fayetteville and Denver for some period of time and continue to provide for the current and future needs of this family. And, all of this will be during a time when he will be unable work any significant amount. To assist the family during this difficult time, a group of friends have come together to form The VanZandt Family Trust and will be contributing funds to the Trust to be held and expended for the benefit of the family! 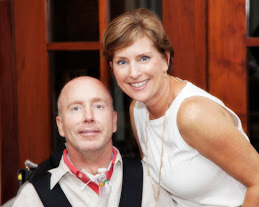 I have agreed to serve as a trustee of the trust and I have asked Robyn to serve with me as a co-trustee. Thanks again for all of your thoughts and prayers. Tommy kicking back at the office!